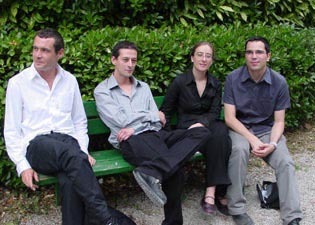 dzo architecture was founded in 1998, by architects arnaud descombes, antoine regnault & david serero, graduated from the paris-villemin. the group included later the spanish architect elena fernandez graduated from the etsam. the projects of dzo received several architecture awards: europan 6 (mentioned), arca 2001 (mentioned), sarajevo concert hall (second prize), virtual museum (mentioned), threshold/place of architecture (mentioned), edf (first prize), hotel in lille (second prize), and were presented in the exhibitions art of the accident in rotterdam (1998), transarchitectures 3 in france and germany (1998), recently at the pavilion de l’arsenal (2001) and the architectural league (2002). in 2001 dzo received the "nouveaux albums des jeunes architectes" award and the "young architects forum award". in 2002, dzo was selected to present its work in the french pavilion at the viiith venice biennale.